Now that Thanksgiving is over, and most of us have a surplus of leftovers to contend with, why not try something a bit more exciting than turkey sandwiches? This traditional Mexican recipe with a Thanksgiving twist puts that cold turkey to good use! Originating from Central Mexico, Sopes are a thicker version of a corn tortilla, and retain all the goodness of fresh corn tortillas, without the hassle of using a tortilla press. We’ll also put a seasonal twist on traditional pico de gallo by using cranberry sauce to add sweetness. For this recipe I used Quattrociocchi pepper infused oil for the light spiciness that Mexican food needs. Optional: if using corn tortillas, wrap in aluminum foil and place in a 350 degree oven for 10 minutes. Then skip to "Add cubed turkey…" below. Mix all the ingredients for the pico de gallo well, reserve in fridge. Mix the masa harina and water by hand until it form a soft, elastic ball. Add oil and salt. Portion into 6-8 small balls and press into 3″ diameter discs about 1/2 inch thick. Heat a deep pan to medium heat with 1/2 C olive oil. Fry the sopes 2-3 minutes per side until lightly browned and cooked through. Remove and keep warm. Add cubed turkey, salt and cumin. Fry until browned evenly, adding oil if meat becomes dry. 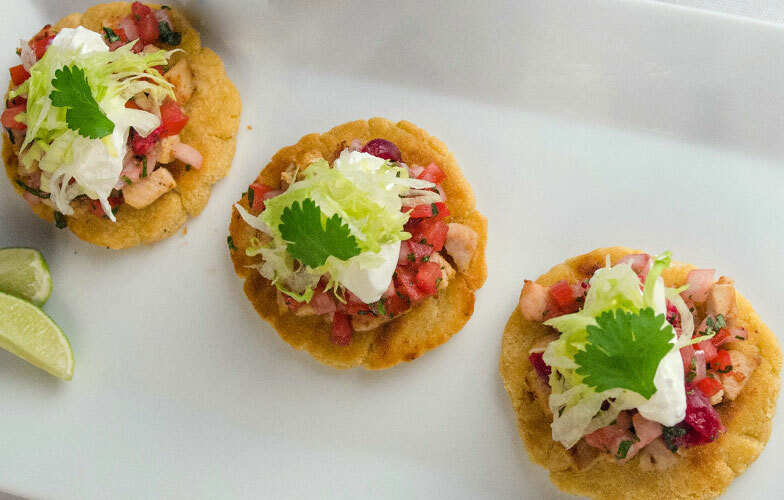 Top each sope (or tortilla) with the turkey, pico de gallo, crema, and chopped lettuce. Serve with slices of lime.